Note: Today’s “Spider Sunday” appears on my companion blog, Sense of Misplaced, for reasons that will become clear if you visit that site. 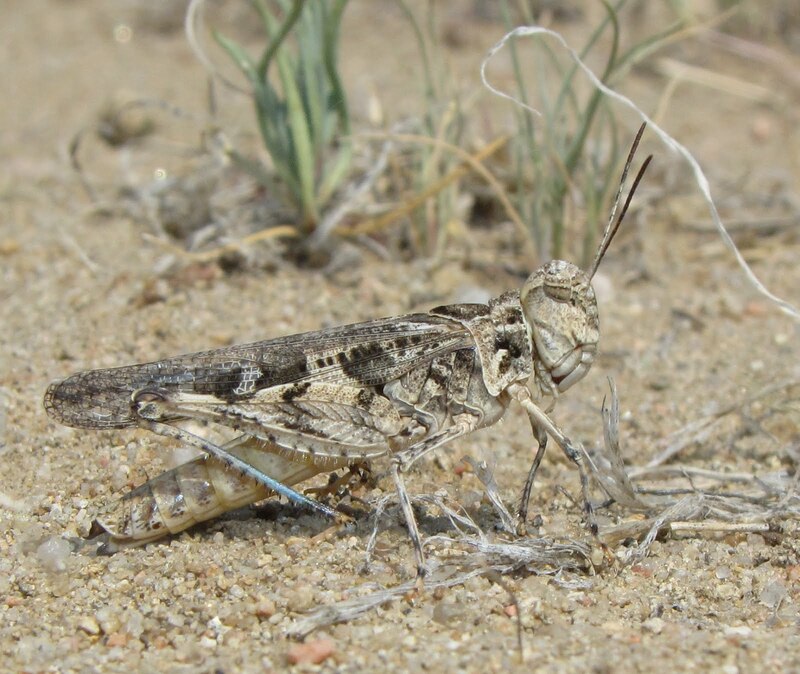 Here on the Front Range and high plains of central Colorado, it seems that grasshoppers are ever-present and the diversity ever-changing. 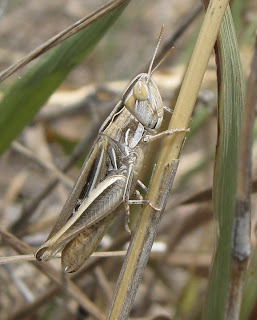 The continuing drought has no doubt contributed to the overall abundance of Acrididae (short-horned grasshoppers) this year. 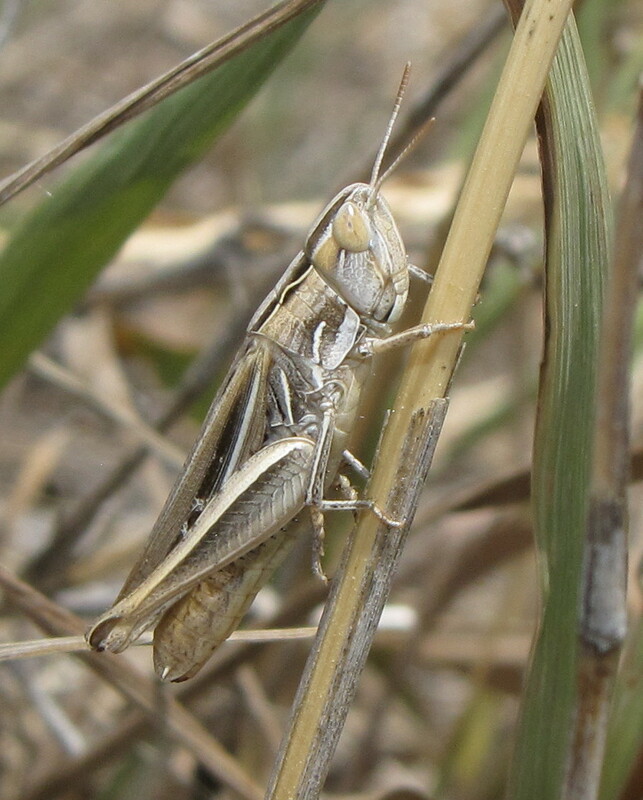 I was finding adult Speckle-winged Rangeland Grasshoppers, Arphia conspersa, on the last day of February, and it has only gotten more amazing since. Easily the most exciting discovery I made was spotting the Crowned Grasshopper, Trachyrhachys coronata. 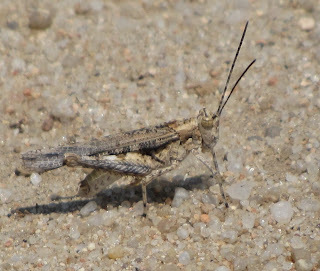 I imaged the female shown below on June 2, just up the street in a vast vacant lot with very short grasses and herbs, and small, widely scattered elm trees. I was completely perplexed by the leopard-spotted pattern on what is really a pretty slender animal. Most leopard-spotted grasshoppers are very large and robust. 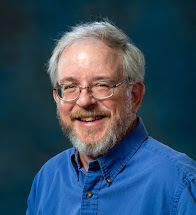 Enter David Ferguson, a grasshopper expert who lends his knowledge to Bugguide.net. I e-mailed him the image above and pleaded for help. 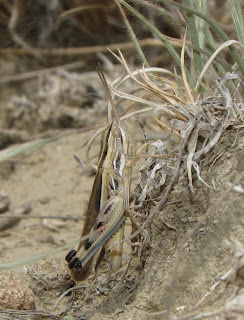 He recognized it as a female Crowned Grasshopper, a seldom-seen species. 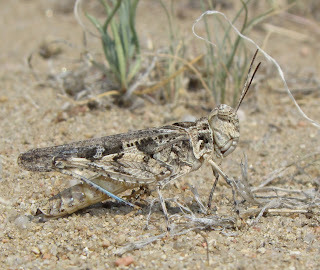 Indeed this picture, and the one of a male taken on June 29 (below) may be the only images of live specimens in existence, at least in the digital age. 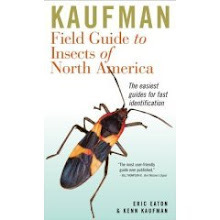 No wonder I couldn’t find a match on Bugguide or elsewhere. The most common species of Trachyrhachys is T. kiowa, shown below. Note the blue hind tibia. 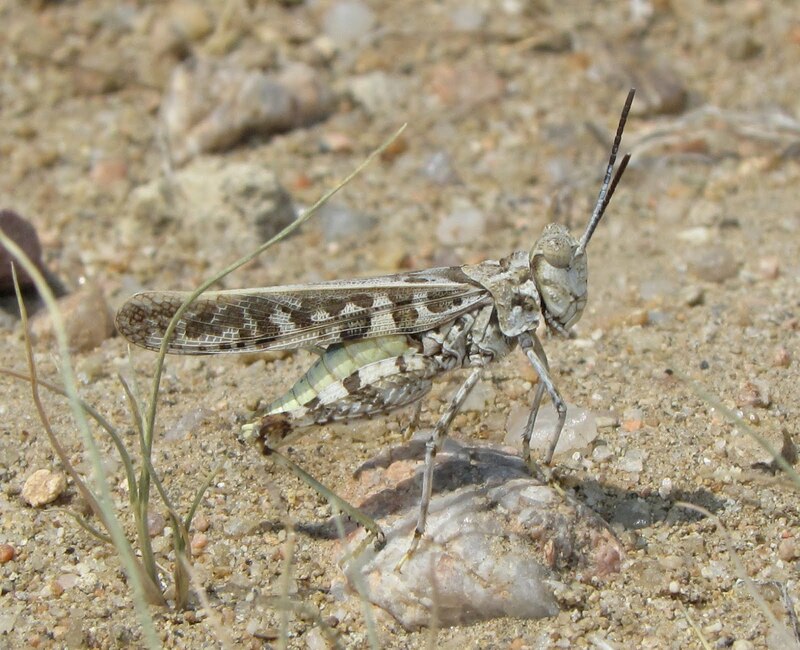 When it flies, the hind wings are either clear or yellow, with little or no contrasting black band. Hard to note such details when they explode from underfoot and then quickly land again. This one is on the wing right now, a very common species. 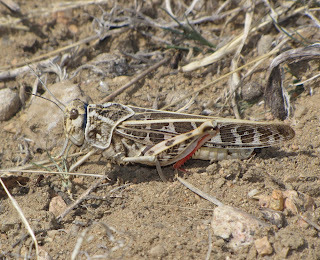 The enormous female Red-shanked Grasshopper, Xanthippus corallipes, shown below, is more typical of the leopard-spotted grasshoppers. She keeps her most vibrant colors mostly concealed. The back of her head is blue, and the inner surface of her hind femora (“thighs”), and the entirety of her hind tibiae, are bright vermilion. Her hind wings, visible only when she is flying, are bright yellow with a black band. By the side of the road at a major intersection I found the slender little ‘hopper below, Derotmema haydeni. It was so hot that it was elevating itself on only four of its six legs, and headed for the shade of a small plant at the first opportunity. 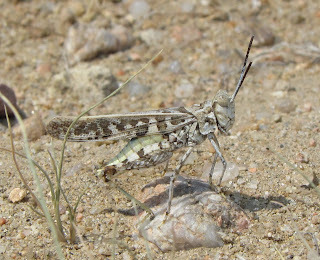 This species can have yellow or red hind wings with a black band. Wait, there’s more. This specimen that I found on the door jamb of my apartment I had pegged as Opeia obscura, but no-o-o-o, just another Eritettix simplex. The Velvet-striped Grasshopper is surely one of the most abundant species here in Colorado Springs. Virtually every vacant lot has them. 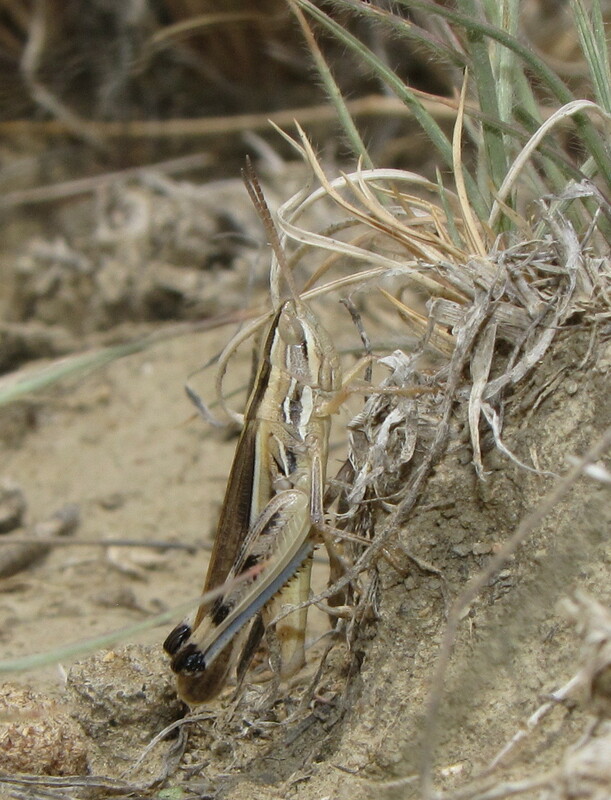 An even more handsome species is the Striped Slant-faced Grasshopper, Amphitornus coloradus. It favors bunchgrasses and I only found it in one little patch amid yucca and prickly pear cacti. Stay tuned. 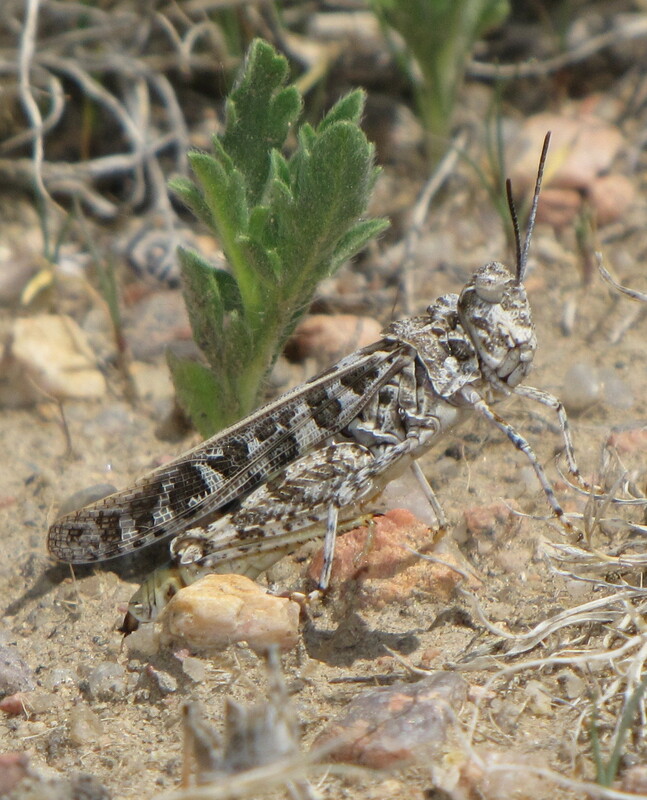 Last Monday I went through the wilderness between Cañon City and Pueblo and turned up some incredibly stunning grasshoppers. You literally have not seen anything yet! 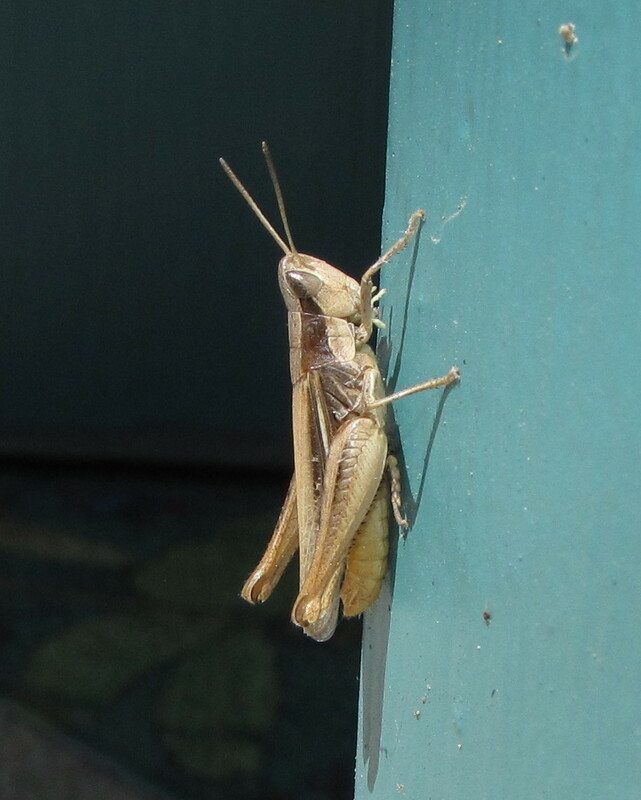 Are all kinds of grasshopper nationwide or are there some that are specific to some regions? Where is Mary's Peak compqred to Vancouver, WA (where I live)? 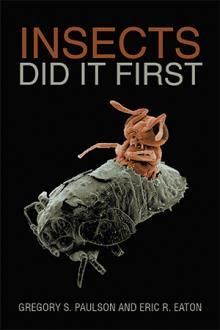 And whqt does the species look like? Hi, Suz :-) You would be describing a nest of Bald-faced "hornets," which are not true hornets but simply large yellowjackets. How cool that you get to observe the growth of the nest! Come fall they will liberate males and new queens, then the workers and queen that are left will abandon the nest. Only queens can overwinter. Thanks for sharing your experiences! @Margaret Antonelli: Mary's Peak is in Oregon, west of Corvallis (south of Vancouver, WA). Not sure which species, I'd have to look it up. 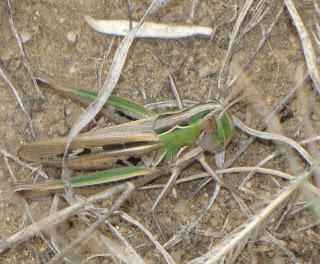 Many different species of 'hoppers look nearly identical to each other and you have to examine their external genitalia to identify them. P.S. Your father was my best friend in high school. I miss him dearly. 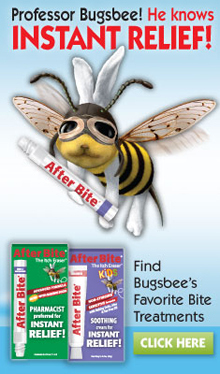 BugEric24ATyahooDOTcom.